WASHINGTON -- The case of Blu Gator, a 1-year-old pit bull living in Issaquah Highlands, is headed to court this summer. Peggy Noblitt, the owner of the 60-pound, female American Staffordshire pit bull terrier, has refused to abide by what she calls discriminatory conditions imposed on Blu Gator by the Issaquah Highlands homeowners' association. She has responded to a suit from the homeowners' association by launching a countersuit of her own. Among other things, the homeowner's association has ordered the pit bull to be muzzled, spayed and confined inside a secure kennel when she's in the back yard [by himself]. Noblitt is also supposed to take out $250,000 of liability insurance [which could simply be done by adding a rider to her current homeowner's insurance policy]. Both sides say initial hearings could begin as early as next month. In an alleged case of pooch profiling, Noblitt says Blu Gator is being singled out because similar or related breeds have been involved in highly publicized attacks on people. The homeowners' association, backed by Port Blakely Communities, the developer of Issaquah Highlands, wants the court to enforce the special conditions or order the pit bull out of the residential development. John Adams, president of the homeowner's board and a Port Blakely Communities employee, says the legal focus of the case is simple. "Can a homeowners' association adopt and enforce a rule?" he said. Valerie Bittner, Noblitt's attorney, says the state Supreme Court ruled in 1998 that restrictive covenants for homeowners are legal -- but only if they're applied in a "reasonable, rational, fair, impartial, prudent and nondiscriminatory" manner. That hasn't happened with Noblitt, Bittner said. The homeowners' association says it began enforcing a ban on pit bulls in March. But Blu Gator, in place before the ban, was "grandfathered in" by the association with the aforementioned conditions. The rationale for setting special conditions for specific breeds is based on the assumption that certain dogs are genetically more predisposed to lethal attacks. But delving into the available evidence produces questions as well as answers. In a special report issued by the American Veterinary Medical Association in 2000, statistics were accompanied by cautions. In 1997 and 1998, the report says 27 people died in the U.S. from dog bite attacks. Rottweilers and "pit bull-type" dogs were responsible for around 60 percent of the deaths. * There is no well-defined pit bull breed. Several breeds fall into that general, nontechnical category. * The intense publicity some pit bull attacks have generated may have led to an overreporting of pit bull incidents in witness accounts and media stories. * Pit bulls have become popular with owners who train their dogs to be aggressive and dangerous. The last point raises the nature versus nurture issue in Bittner's mind. "The dog is very sensitive to the cues you're giving it," Bittner said. Adam Karp, a Seattle attorney who specializes in animal law, points out that attack totals for a specific breed are meaningless because we don't know the population numbers for specific breeds. In 1997 and 1998, 10 fatal attacks were attributed to Rottweilers. But because we don't know how many Rottweilers existed in the United States during that time, it's impossible to know what percentage of the breed was involved. "Without knowing the number of animals in the United States by breed, one cannot meaningfully compute risk," Karp said. Noting that cities, apartment houses and other entities make rules about what kinds of pets are allowed, Adams is optimistic the homeowners' association will fare well in court. But Bittner believes the constitution provides protection from the "unchecked power of private government schemes." "This is not just a dog case," Bittner said. "This is about the whole power structure of homeowners' associations." 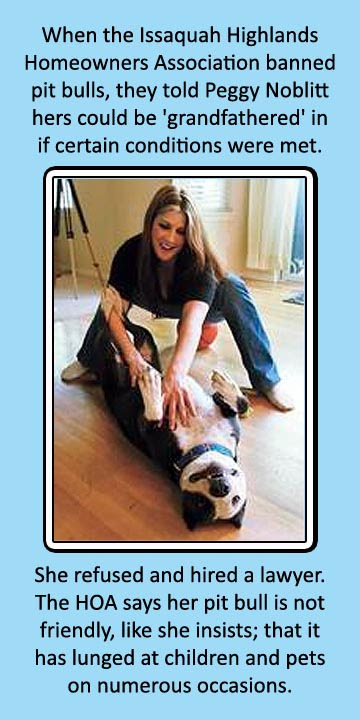 Washington: When Peggy Noblitt's HOA enacted a ban on pit bulls, they told her she could keep hers as long as she complied with a few things. She refused and got a lawyer instead. FLORIDA -- A man has been charged with animal cruelty on the suspicion that he killed a peacock, then cut off the bird's wings, claws and feathers and stuck the carcass in his freezer for a later meal. Randall Jude Konarik, 34, of 1220 Palm St. was arrested Monday morning on a charge of cruelty to animals. He was being held at the Pinellas County Jail on Tuesday afternoon in lieu of $10,000 bail. Clearwater police on Saturday received a report that Konarik had captured a peacock in Dunedin, then brought it to his home, tied it to a brick and killed it. When police talked to Konarik, he told them he struck the bird in the head with a rock, then kicked it. He told police he then picked up the bird by its wings and feet and carried it 2 miles to his home, an arrest affidavit states. Konarik told police the bird struggled during the walk, which he said "caused the bird to die from heat exhaustion a few hours later," an arrest report states. Konarik said the death was accidental and occurred while he was trying to relocate the bird. Once the bird was dead, Konarik removed the bird's wings, claws and some of its feathers. When asked why, he told officers: "Because that's what hunters do," the arrest report states. He then skinned the bird and placed it in his freezer to eat later, police said. It was unknown exactly where in Dunedin the bird was captured. Peafowl have recently created some controversy in one north Clearwater neighborhood. Some residents have tried to remove the birds, complaining they are noisy and messy. That hasn't gone over well with other neighbors who enjoy their beauty. "I'm in shock to say the least," said Susan Sander, one of the peacock lovers. "To me, animal cruelty is equal to a person. They're God's creatures. I'm so saddened." Though the birds are very pretty, some who live in neighborhoods where they roam don't appreciate their harsh squawks, particularly during mating season, which is around May. The birds also are known to tear up flower gardens, and even to peck at cars when they see their image reflected. The birds have lived in the area of the Clearwater-Dunedin border since the 1920s, when there was a peafowl farm there. The birds were raised for their tail feathers, which were a popular fashion item. When the farm folded decades ago, many of the birds were simply let loose. They have strutted the area ever since. Rick Chaboudi, executive director of the Humane Society of North Pinellas, said he has never heard of someone killing a peacock, then saving it to eat. "I have never heard of anyone ever hunting peacocks," he said. "You can't just execute them or mutilate them or things like that." Konarik was riding his bike across US 19 N and East Bay Drive when he was hit by a car and seriously injured, Tuesday. Officials said the bicyclist was riding against the traffic signal when he was hit by Skylar Martz, 26, of Largo, who was driving a 1994 Nissan Sentra. Martz was traveling eastbound on East Bay Drive through the intersection when Konarik came into his lane in a southbound direction, officials said. According to Largo Police, witnesses said Konarik was crossing the intersection outside the crosswalk and against the traffic signal at 10:04 p.m. when he was hit. WASHINGTON -- The owner of a 60-pound Pit Bull terrier has been hit with a lawsuit by the developers of Issaquah Highlands. The legal action follows Peggy Noblitt's refusal to comply with special rules for Blu Gator, a 1-year-old dog many residents say falls into the "pit bull" category. In addition to muzzling Blu Gator, Noblitt has been told to spay her, confine her inside a secure kennel when she's in the back yard, and take out $250,000 of liability insurance. Noblitt, who describes Blu Gator as 'friendly and playful', says her dog shouldn't be discriminated against because similar or related breeds have been involved in highly publicized attacks on people. Port Blakely Communities, the developer of Issaquah Highlands, hopes the court will help in one of two ways. "The court will either order that the rules be complied with, or that the dog be removed from the community," said John Adams, a Port Blakely official. But Noblitt, 37, says she will fight back. Her attorney is preparing to file counter claims, perhaps as early as this week. In March, the homeowners' association began enforcing a new rule banning pit bulls from the planned community. But Noblitt's dog was "grandfathered in," so long as the special conditions were complied with. 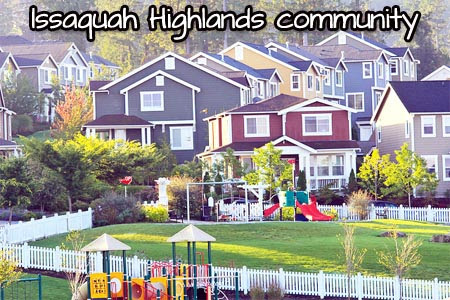 Issaquah Highlands' rules are not unique. Many cities, including Kirkland and Everett, also impose muzzle requirements and other special conditions on pit bulls. Noblitt says she wholeheartedly endorses dangerous-dog legislation, but objects to rules that focus on individual breeds. If her dog became aggressive or dangerous, she would put Blu Gator down, Noblitt said.